lovely outfit, the blouse is cute! your stripe top is super cute. I only have watched the voice once. OMG! LOVE that top SO much! It's seriously so fun and adorable!! You are totally rocking that look!! What a lovely look! Love the striped shirt! It's so cute and delicate! And your hair bun is super stylish! Following your amaizng blog dear! Love your hair due!!! I've been watching American Idol and we are down to 4 people!! and I want 3 of them to win lol it's driving me crazy! That top is so much fun - love it! I love that blouse - perfect for spring and summer!! I am a stripaholic ( yes there are such people who suffer from this affliction) and I am LOVING that top. I had no idea what I was going to wear today but you have helped sway that its strips for me!!! i love this jeans !! I like stripes, have lots of shirts with stripes :/ Lol That one is really cool! I love this sweater. Those colors are gorgeous together! We are following you lovely!! um i think you picked the perfect striped top to start with. and i love it paired with your distressed jeans. Loooove this outfit! The top is fabulous! Lovely outfit and hairstyle. Your shirt is beautiful! You look great in this casual and fresh look !! lovely blouse!! Love the blouse, the colors are beautiful! Love the top! And your hair looks so cute in the high bun! Cuuute top! Love those flats too & your hair! I love your top! Its so colorful and fun! Cool look and great pictures ! That is a really great shirt! Hello, fun shirt! I am going to have to look at that top, the colors are fun, and it is not a plain ole black/white striped top. Love how this look puts vibrant colour into stripes, very cute and eye-catching. Beautiful top, love the colors. thank you for your lovly comment ♥ your blog is great, i follow you, if you like follow me back. the top is so great :) i love the colors. I love your pant and your shoes ! You blog is so nice ! I really really love !! Fun top! I love it, and you can never go wrong with colors and stripes! That is one super fun shirt, me wants! Ha! It's great you can style it up for evenings too with black bottoms and serious bling! You look great! Ans that top is amazing! S.
Lovely outfit! Love your bun. Super cute outfit! I love stripes! You look great dear, that top is so beautiful, so colorful.. Thanks for visit my blog, would you like follow each other? Your jeans look so cool ! I'd love to have a pair of the perfect boyfriend jeans, to wear them with crazy heels and feminine accessories! I love the stripes - what a FUN striped shirt. And, I like the pairing with the jeans. I love that top! There's one similar at Urban Outfitters that I've been eyeing. So cute! Great top! Such fun colors. And love the fit of those jeans too! A lovely casual look overall! Such a cute top and I really love the jeans! I'm looking for some ripped ones -- I'm going to American Eagle after work! I LOVE the striped top. Super cute. I haven't been watching the Voice, but I saw who won and I definitely think he deserved it!! love how the stripes match both top and bottom! oh pretty, pretty shirt! lovely outfit again! You look great Giovanna, I love this top - so colourful! Nice top, the colours are so bright and pretty. love your blouse dear! !super cute!! 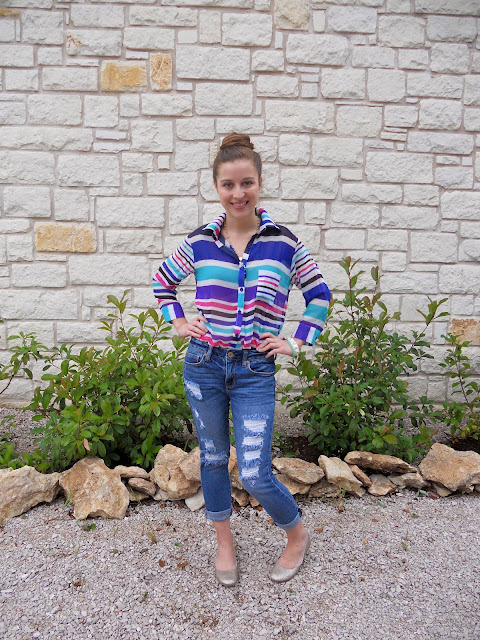 LOVE LOVE LOVE this striped top! So cute on you! So cute! I am such a sucker for striped shirts! Wow, now that's a fabulous striped top! I'm a fan of the top. I lke the bright colors! I'm sad The Voice is over too, but It's okay because I have The Bachelorette coming up to replace it. I love the strip top and you have made the perfect bun in your hair! wow , that stripped shirt is too dope! i love all the different colors , its pretty perfect for the spring/summer season! that colors are amazing!!! you look great girl! Thanks so much for visit and comment on my blog!! Love these pics! the shirt is amazing! so colorful!! you look so stunnning - absolutely love the look !! Love that top, and it beautiful on you - blue is definitely your color. Now following through GFC. BTW sad about the voice being over too - oh Adam, can't get enough. Love that striped blouse and the bun is all sorts of fab!!! 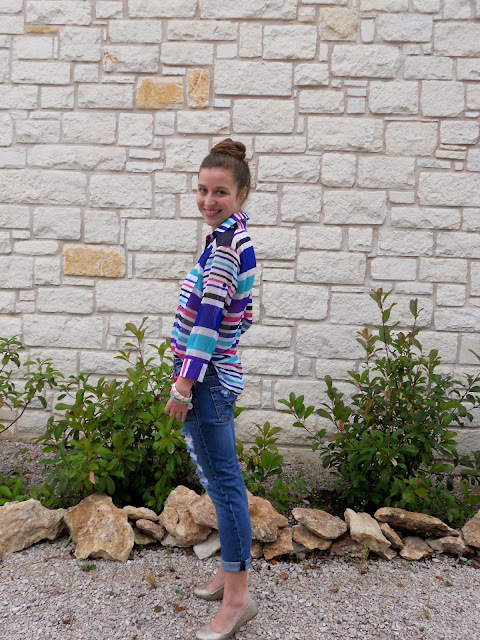 oh i´m a huge fan of coloured stripes so i love love love your shirt darling! Oh you look so pretty in these pictures! Thanks for stopping by my blog! So cool outfit!!!! So springy! Jeans carinissimi :D Reb, xoxo. that top is fierce! love it. happy weekend! You look adorable! the top is tropical and so bright - love it! I'm absolutely in love with your shirt! What a great top! I love it!!! Great blog. Love the striped top, the colors and uneven stripes make it very cool. Your stacks of bracelets are a ton of fun too. I'm sad the Voice is over too, Adam is so fun to look at! I love your shirt and shoes so much!!! Following you! Nice outfit! I like your colorful striped top. I love this blouse. I need to own it. I think I might order one right this minute! You always look so gorgeous.